Easter Basket Gifts are so much fun. They make it even more exciting to wake up on Easter morning. As a child I was so thrilled to check out my Easter basket early on Sunday morning before leaving for church. The anticipation was half the fun. As I grew up I took just as much pleasure in planning Easter baskets for loved ones. It's just as delightful to see the excitement and anticipation in someone else's eyes. What kind of gifts are you looking for? Are you looking for gift ideas to fill baskets that you already have? 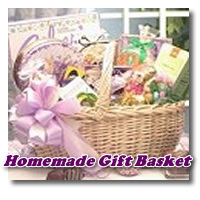 Maybe you would like to order the Easter baskets already made up and have them delivered? If you want to order a beautiful Easter basket for someone you love, there are some great places online that make your job easy-peasy. I've got a beautiful selection at the bottom of the page that'll give you a fair idea of what's on offer. Scroll down and feast your eyes on some of my favorites. Also, lovely baskets can be ordered at any of these high quality sellers. You are probably going to have a tough task choosing between them. Some people, like me for instance, enjoy creating their own Easter Gift Baskets. If that's your plan, don't worry. It's so easy! 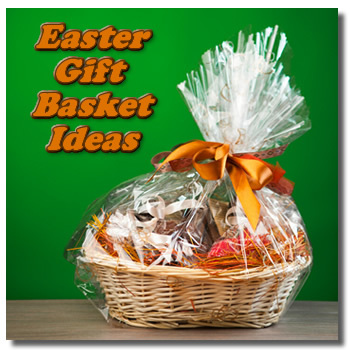 Just pick up a basket, large bowl, or small sturdy box (wrapped in tissue paper or Easter wrap) and you're on your way. Fill the bottom with Easter grass, tissue paper, shredded paper, or anything else you think would suit. You just want to provide enough "lift" to display your lovely gifts properly. Begin filling your basket with anything you think your loved one would like. For kids you probably want to start and end with candy :-), but you can throw in other fun things like coloring books, crayons, markers, small toys, anything you know they'd enjoy. For adults, you may want to go with items a little more sophisticated. Don't get me wrong. I'd still start and end with chocolate! :-) But I'd include things like a candle, lotion, gourmet tea or coffee, perfume or cologne, gourmet cookies, homemade fudge, nuts, jam, jewelry... Oh, I can really get into this! Adagio Teas - Gourmet teas that anyone would love. Candy.com - another bulk supplier, and very inexpensive with plenty to choose from. I hope you'll find just what you need to make your Easter Basket Gifts a true success. Do let me know if you need any further help finding something. I'd also really love for you to take a few minutes to read about the history of Easter and why it is so special to me. Have a blessed Easter weekend!